A muffled voice — “Coming, mom” — followed by a stampede of heavy footsteps crashing down the stairs. Twelve-year-old Bailey rolled her eyes and pretended to turn up the volume on her iPod. But Annie noticed a hint of a smile as she did it. Charlie had that effect on pretty much everyone. Annie waved goodbye and watched Charlie wade into the crowd of students, backpack slung over his shoulder, stopping every few yards to chat with someone or high-five another boy. She recognized Aaron Parker from across the street and the Apperson twins from next door. Aaron got up from the bench he was sharing with two pretty blonde girls, and he and Charlie walked into the school together. Annie sighed and checked the rearview mirror and pulled away from the curb. Annie sat at the traffic light after dropping off Bailey, waiting for the light to turn green. My little girl’s not so little anymore, she thought sadly. And definitely not acting much like her little girl these days. She hadn’t even said goodbye when she’d gotten out of the car. Annie noticed a MISSING CAT poster taped to a street sign and snapped a picture of it with her cellphone in case she ran across the kitty later. It was exactly the sort of thing Bailey would have once applauded her for, but now would have poked fun at. Annie didn’t care. They had lost their Corgie, Max, three months earlier, and it had been a heartbreaking time for the entire family. One day Max was there, begging for breakfast scraps at the table, and the next day they couldn’t find the little guy anywhere. They’d hung posters, called area vets, organized search parties. But they’d never found him. The not knowing had been the worst. Wouldn’t it be wonderful if she somehow found and returned — she checked the photo on her phone — Sparkles the cat? That would show Bailey, wouldn’t it? The light turned green and Annie headed for home. I can’t forget to make cookies for Bailey’s class tomorrow. I better write myself a note. I can’t forget to pick up Mark’s shirts at the drycleaners after lunch. I can’t believe Lisa is having an affair. It was this last tidbit of gossip that occupied her thoughts as she exited the car and walked into the house. And that’s exactly what it was: gossip, because it was all just speculation at this point. Lisa had admitted to nothing. How could she? None of the other neighborhood ladies had confronted her with their suspicions. Annie didn’t know what to think of the whole thing. Yes, Lisa had been acting strangely distant lately. Yes, she had cancelled their last lunch and their last two book club meetings. Yes, she was all of a sudden eating healthier and working out like a madwoman. But did any of those things really prove anything? Annie decided she didn’t care and was tired of the other women talking about it. It felt…mean. And none of their darn business. Annie placed her purse back on the counter where she always left it and looked around the kitchen. She glanced through the arched doorway into the living room. Some women complained about housework, but Annie actually enjoyed it most days. She believed it was a privilege to stay home and raise the kids. To take care of the household. It was valid and valuable work, she always said. Annie turned on the radio in the kitchen, adjusted the dial until a Justin Timberlake song came on. She turned up the volume and twirled around the kitchen, singing and giggling. The song ended, and she started loading the dishwasher. Annie paused at the bottom of the stairs, adjusting the laundry basket on her hip. It was her second trip upstairs from the basement laundry room, and she was tired and hungry. One more and she would make herself a sandwich for lunch. She walked into Bailey’s room, placed the basket on the bed, and transferred an armload of socks to her sock drawer. The rest of the clothes belonged to Charlie, so she picked up the basket and crossed the hall into his bedroom. While Bailey’s bedroom looked as if a tornado had touched down in the middle of it, Charlie’s room was neat and orderly. Football and basketball and soccer trophies lined up just so on his two bookshelves. Books in alphabetical order. Posters hung above his crisply made bed. Framed family and sports photos hanging above a desk that held only a computer and keyboard and a pen and pencil holder. Thank God Charlie takes after me, Annie thought, starting to hang his t-shirts in the closet. At least one of them does. She started to turn back to the laundry basket for more shirts and almost tripped over the shoe box on the floor. Charlie had once watched an ESPN interview with a rookie basketball star and they had shown the young man’s closet. Row after row of shoe boxes. Stacked high and wide. Each box containing a brand new pair of basketball shoes. Charlie had been fascinated and shortly thereafter declared that he wanted to do the same thing — on a much smaller scale — in his own closet. So, every time he bought a new pair of shoes, he added the box to his neat little stack at the bottom of his closet. Except today one of them was sitting out on the floor. Annie couldn’t remember that ever happening before. …and something inside the box rattled. Puzzled, she opened the box and looked inside. At first she thought it contained nothing but crumpled tissue paper, the kind which stores use to wrap new shoes with. But she gave the box a shake, and it rattled once again. She walked to Charlie’s bed and sat down, the shoe box on her lap. She tossed the lid on the bed beside her and started pulling tissue paper from the box until her hand touched something that felt like leather. She pulled a dog collar from the box, a heart-shaped tag rattling against the metal buckle. Annie sat there, frozen with surprise. She wouldn’t have been more shocked if she had found a live snake inside the shoe box. What was it doing here? How was it here? And then it came to her: Charlie had found Max dead somewhere. In the woods beyond the back yard. Alongside a roadway. He had found their sweet Max and kept it to himself, sparing the rest of them the hurt he was experiencing. That would be just like their Charlie. Annie felt tears come to her eyes. A thickness in her throat. My poor brave boy. She placed the collar back into the box and her hand brushed against something else. She pulled it out from the box. A tangle of smaller collars. The kind that cats or small dogs wore. Again, Annie sat there for a long quiet moment, dumbfounded. And then her hand started shaking. It was suddenly hard to breathe. She started to look at one of the tags — and stopped. She realized she didn’t want to see. She suddenly felt sick to her stomach. Don’t be ridiculous, she thought. Of course, there’s a good explanation. Annie almost screamed when the cell phone in her pocket rang. She jerked to her feet, spilling the shoebox and Max’s collar from her lap to the floor. She looked at the caller ID on her phone. Annie couldn’t take her eyes off the collars in her hand. She flipped one of the tags over. Annie brought the tag closer and read the tiny print. Annie didn’t hear a word. The phone slipped from her hand, landed on the floor next to the shoebox. She stared down at it for a moment. Saw that she was wearing her favorite shoes. Somewhere, outside in the distance, a lawn mower roared to life. A work truck backed up: BEEP BEEP BEEP. Someone tapped a car horn. Annie slowly bent down, as if in a dream, picked up her phone and the shoe box with the same trembling hand. Tissue paper slipped to the floor. She ignored it. She glanced inside the box and saw that it was empty. There was a key inside. Tucked against the narrow end of the box. She took the key and let the box fall from her hand. She didn’t have to wonder about the key. She remembered all this as she walked down the stairs, ignoring the voice in the back of her head telling her to call her husband at work, that something was wrong here. She had gone onto the deck one warm spring evening to read a book and drink a glass of wine and had found Charlie putting a padlock on the old shed in the back corner of the yard. The shed had been battered and leaning even when they’d first moved into the house ten years earlier. After Mark had assured her it was safe and wasn’t going to collapse, the shed had spent most of the years that followed as Charlie’s “secret fort”. It wasn’t much of a fort, and it certainly wasn’t a secret, but Charlie had adored it. He had dragged an old card table inside and three folding chairs. Stocked it with books and comics and playing cards. Hung posters of Michael Jordan and Kobe Bryant on the walls. But Annie hadn’t seen him inside or even puttering around the shed for several years until the night of the padlock. She had leaned over the deck railing and yelled down to him that evening. He looked up, startled, and then that trademark grin of his had come onto his face. Annie no longer felt like she was moving in slow motion, like she was part of some bizarre and confusing dream. By the time she had made it downstairs and outside, she had convinced herself that she was being ridiculous. That the collars and key meant nothing, certainly nothing dark or dreadful. It was a mystery, but it would all make sense in time. She crossed the back yard with long, purposeful strides. Didn’t hesitate once she reached the shed. She slid the key into the lock, popped it open on the first try and hung the lock on the hinge of the shed door. …and the smell hit her. Probably just a dead mouse in there. There was no electricity in the shed, so she swung the door open as wide as she could, jumping when the heavy door banged against the front of the shed. She stepped into the doorway, the tips of her overpriced shoes toeing the dirt floor inside. The smell was worse now. She covered her nose and mouth with her hand and squinted into the darkness. It was impossible to see. She stepped inside the shed. And the inside voice whispered: that’s not a mouse, Annie, and you know it. And she did know it…because her eyes had started to adjust to the gloom and she could see them now. Hanging from nails stuck into the walls. Some of them pink and glistening and freshly skinned. Others dried out and yellowed and rotting with age. Still others sliced open, insides dripping into wet, ropy piles onto the dirt below. And then she saw Max. Annie drops to her knees and gets sick right there in the dirt. She heaves until there is nothing left inside her and when she finally looks up, looks beyond a gutted and crucified Max…she sees the worst of it. There are dozens of photos on the far wall. Erin Cavanaugh. Their neighbor from down the street. One of the girls Charlie grew up with. The wall looks like a shrine. …but there is someone standing behind her in the doorway. Silhouetted in the afternoon sunlight. Annie does scream this time, and the person steps forward. Bailey takes another step, a strange look on her face Annie has never seen before. She notices that Bailey’s hair and shirt are soaked in sweat, as if she had run all the way from school. Bailey takes another step and this time Annie notices something else: her little girl’s hands are hidden behind her back. The little girl glances at the walls, then back to her mother. Bailey looks like she wants to cry. Annie tries to speak, but nothing comes out. She backs up another step. It’s fear she is feeling now. She is more afraid than she has ever felt in her life. Bailey takes another step forward. Annie backs away. Her baby girl. Big and strong for her age, just like Charlie. Bailey takes another step and starts to move her hands out from behind her back. Annie backs up another step. And her back touches the wall. 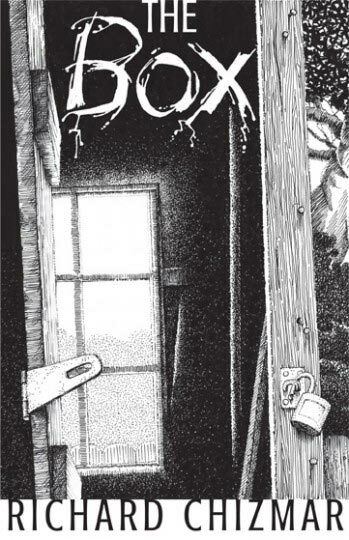 “The Box” will also appear in Dark Places, Evil Faces, edited by Mark Lumby, U.K., in 2017.